Our business, Greeen's Machine Shop has been in business since 1917. We pride ourselves on providing customers with the best-quality products and personal service. You can order from us using our online catalog or order over the phone. Have you ever tried to pick up things without using your thumb? It's almost impossible! That is why you should have "The Thumb" on your loader bucket. It will allow you to move hard to handle materials easier. It will work on many different buckets - skidsteer or tractor. The thumb is a real time saver. 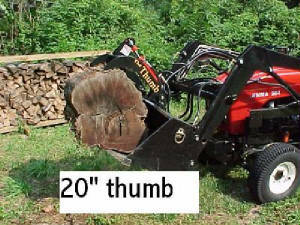 It works great for picking up just about anything - logs, brush, roots, rocks; and is great for demolition too. 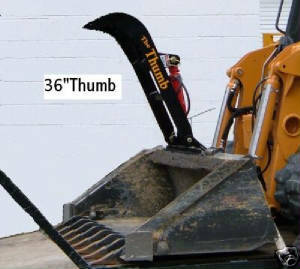 The Thumb is 18" wide and comes in 5 different sizes of length. They are 20", 24", 28", 32", 36" long. 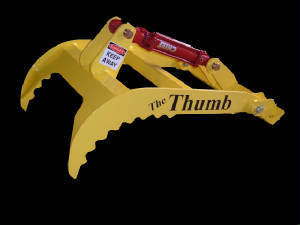 The Thumb constructed from 3/8" plate steel and is reinforced with 2 or 3 - 2" square 1/4" wall tube. The points are reinforced with 1/4" triangular gussets. The base is 1" x 3" solid steel so it won't twist. It is all mig welded in a jig and they are built tough for reliability and long life. The new agricultural tie-rod cylinder is rated for 2500 psi. with 2" bore x 6" stroke with 3/8" NPT ports. Hoses are not supplied. The Thumb is base plate is pre drilled can be bolted or welded to the flat spot on top of your bucket. The base plate is 24" long and two thumbs can easily be mounted and independently controlled. Some buckets require reinforcing on the top. The color is black powder coated. 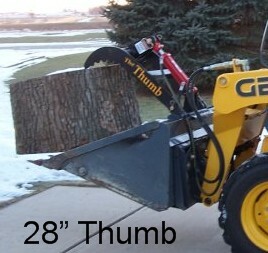 Measure from the cutting edge to the top of the bucket to determine the correct size. If you have questions you can call 618 532 4631 M-F 8:00-4:00 Central time or 618 303 2516 cell.